Hello, ladies! 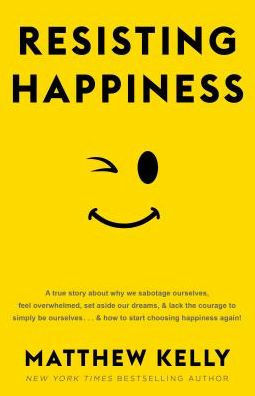 Welcome to the WE Online Book Club over “Resisting Happiness” by Matthew Kelly. If you haven’t already signed up, please see the information below on how to register (FYI: Registration is encouraged, but not required). WE are getting started with our first posting here on Monday, Jan. 21, with the introduction and summaries for Chapters 1 - 3. Nikki Grygar, WE Sister and NASM certified personal trainer, will be leading us through the summaries and discussions each week. Please note that each summary will have a discussion question(s) where you can post your thoughts in a Comments box below. Check out the information below to sign up and other details and how to register. See you back here beginning Jan. 21! Purchase your own copy of, “Resisting Happiness” by Matthew Kelly, and follow along online via your laptop or phone! All are invited to join the WE Online Book Club reflecting on Matthew Kelly’s amazing book, “Resisting Happiness.” This is a true story about why we sabotage ourselves, feel overwhelmed, set aside our dreams, and lack the courage to simply be ourselves. For six weeks, you will read specified chapters from the book and join in the online conversations posted twice a week here on CatholicWE.com, Mondays & Thursdays, Jan. 21 – Feb. 28. Questions? Contact CatholicWE@gmail.com or Nikki Grygar, ngrygar@yahoo.com. from the main posting page: scroll down & Click on the name of the desired Chapter to the left in blue text under the date. From the chapter posting page: please comment in the box at the bottom below the question(s).